Private tour for 1 to 3 people. Santa Fe, New Mexico is the pot of gold at the end of the rainbow! There are so many shops, all full of stuff we really want to buy. From Indian Jewelry, trendy clothes, hand-tooled boots, OMG, hats, and art. The glass is full! Santa Fe truly captures the spirit and style of the Southwest with the adobe style of its buildings and architectural design. The oldest capital city in the United States, Santa Fe wows visitors with endless beauty. A walk through the streets around the historic plaza will lead you to shops and galleries, restaurants, museums, and historic churches. At the Palace of the Governors, you can admire the artwork and jewelry created by the Native Americans sitting under the portal. Walk up scenic Canyon Road with over eighty galleries, restaurants and shops. Santa Fe is an art lover’s and History Buffs’ paradise. From museums to galleries to restaurants, you will be awe struck! We can visit the downtown Museums. The Palace of the Governors is the oldest continually operated building in the U.S. and home to the New Mexico Museum of History, the New Mexico Museum of Art and its outstanding collection of art by southwestern artists, the Georgia O’Keeffe Museum dedicated to her life and artistic legacy, as well as to American Modernism. 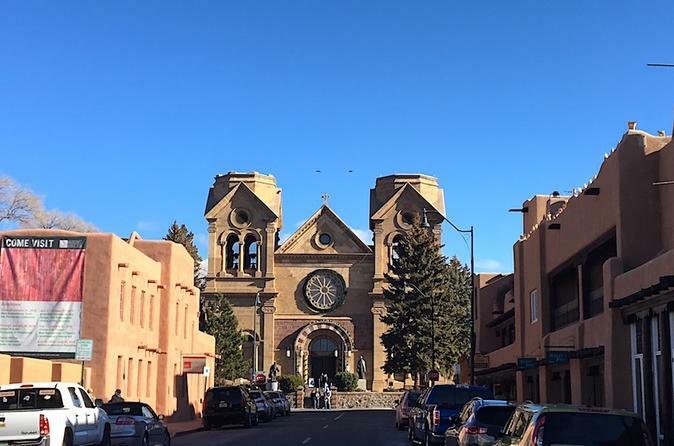 We can visit the famous churches, the historic Cathedral Basilica of Saint Francis of Assisi, a Santa Fe landmark, and a beautiful example of Romanesque Revival architecture and just down the street, the Loretto Chapel and marvel at its mysterious spiral staircase. The identity of its builder and the physics of its construction still puzzle experts today. After lunch at one of the many downtown restaurants where there are chefs galore, cooking for you with the food style of your choice, Italian, New Mexican, Asian, elegant bar menus, Tapas, and steak houses, all in environments that you really have to photograph for people at home to believe. Really it would take a year eating out every day to beginning to taste all the possibilities. A gallery walk and shopping at the many stores in downtown and Canyon Road should quench your need for art, beauty, hats, belts, clothing, paintings, prints, chocolates, and other objects of desire. The offerings do not stop with the exciting shopping from gewgaws to exquisite art pieces sought after by collectors world-wide, and the galleries full of local and international artists available on our Canyon Road Tour. On our way back to Albuquerque we can visit Museum Hill and take your pick of four world-class museums presenting folk traditions from around the world (Museum of International Folk Art), the history of the Spanish colonial past (Spanish Colonial Arts Museum), and the art, history and culture of the Native American Southwest (Wheelwright Museum and Museum of Indian Arts and Culture). For an added bonus, there’s a Botanical Garden and a cafe. You will have to chose how long to stay and how far to go. We have 6 hours if we start in Albuquerque and 8 hours if we start in Santa Fe. You have the choices, the Corn Maidens will drive you, walk with you, guide you, laugh with you and return you to your hotel. So you better book with the ones who know the secrets, know the best of the best, and the off-the-beaten-path places, the Corn Maidens. So much to do, so little time. Tour covers 1-3 people. For more please call. Loretto Chapel, famous "miraculous stairway"
San Miguel Chapel "Oldest Church in the United States"